at least 256G SSD drive. where partitions 1-3 are what laptop came with (just shrinked), 4 is for Refind, 5-6 for Arch Linux and 7-8 for Win 8. Installing system is relatively easy - you can boot an EFI capable boot loader or kernel either from USB or using an SD card. Partitions can be resized from OS X and formatted using Linux installer/livecd. Remember to boot with Thunderport plugged in. After installing Linux I&apos;ve also managed to install windows 8 using EFI boot without much problem. You can switch to intel GPU from OS X and the setting will persist across reboots. To do this you need to run little tool called gfxCardStatus (version 2.2.1 - important), set it to &apos;integrated only&apos; and then boot into Linux. For some reasons version 2.3 doesn&apos;t do the trick, so you need 2.2.1. Afterwards you can switch off Nvidia card using vgaswitcheroo and enjoy the 7 hours long battery live. Guide how to disable built-in GPUs and switch gpu connected to the screen from withing EFI shell - interesting but in the end wasn&apos;t useful for me. HiDPI theme for Sublime based on Soda; and a bug that is making things harder. Powertop is a great piece of software to identify power-saving optimisations. You can export &apos;tunables&apos; and automate enabling additional hardware power-saving features. Screen is wonderful. 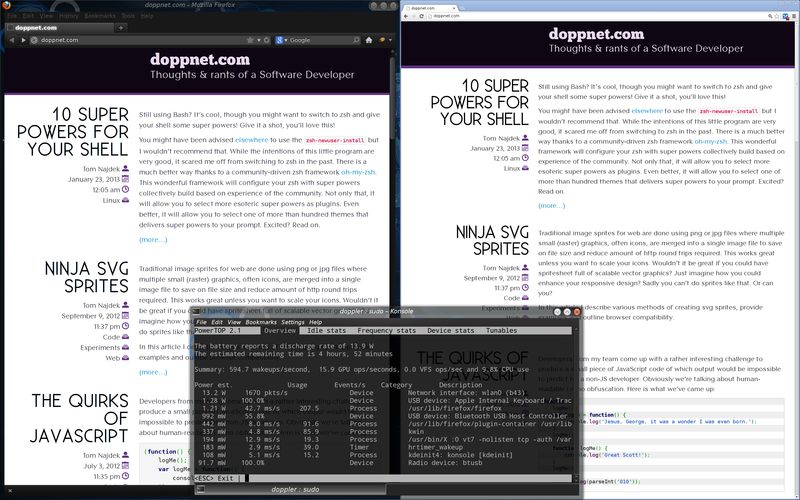 On Linux with DPI set to 144 and running Firefox with layout.css.devPixelsPerPx set to 1.5 web is beatiful. Fonts are crisps and sharp and you&apos;re still getting an equivalent of roughly 1920x1080 worth of space. Windows 8 with &apos;zoom&apos; set to 150% looks great as well in apps that support this setting. MBPr is a really powerful laptop. It can easily drive 4 screens using Discrete NVIDIA GPU (2 through mini display ports, 1 via hdmi and the built-in Retina screen). However if mobility is what you&apos;re after, switch off Discrete GPU and you&apos;re looking at 6-7 hours worth of battery when doing light work. Powertop reports 14-15W discharge while doing normal &apos;coding&apos; + browsing, playing something on Youtube will raise this figure to 20-odd Watts. Sound is surprisingly good for a laptop but if silence is what you&apos;re after - as long as you stick with the integrated graphics and don&apos;t do much compiling (or anything else cpu-intensive) you&apos;re very unlikely to hear fans at all! There is no ethernet port and wireless needs firmware extracted from proprietary drivers. Thunderbolt-to-ethernet port comes handy but there is no support for hot-plugging it in Linux. If you want to plug in external monitors, you will probably need to grab a DP adapter though it&apos;s not too bad as mini-dp is now becoming a standard thus adapters are plentiful. 15" Macbook Pro Retina comes with 2 GPUs however Apple decided to use a digital multiplexer to switch between cards connected to the retina screen rather than to use the hybrid approach such as using Nvidia&apos;s Optimus technolgy. It works ok for OS X though I did manage to boot into Macbook&apos;s operating system and have only external screen working. However support on Linux (or Windows 8 as for this matter) is virtually non-existent. This was the main deal breaker for me. Wifi support under Linux is really poor. Broadcom&apos;s chipset is only partially supported. As long as you stick with 802.11g standard routers you should be ok, with kernel 3.8 I&apos;ve experienced occasional connection breaks and a throughput of about 1MB/s. It gets worse when you connect to the 802.11n standard router - at the moment there is no support for it at all in the driver so you would be capped at theoretical speed 54Mbit/s, and I&apos;ve experience much worse connection drops when connected to the &apos;n&apos; standard router. An alternative is to try the ndis_wrapper but others tried this and it doesn&apos;t seem to be any better. Second deal breaker. If you&apos;re happy to use OS X, this is a great piece of hardware and probably worth it&apos;s orbital price. Unfortunately Apple&apos;s peculiar choice of hardware means that. at least as of February 2013. you won&apos;t be able to run Linux or Windows 8 on it (Windows 7 through fake Bios and &apos;Bootcamp&apos; should work). Luckily Apple let&apos;s you return a laptop within 14 calendar days and that&apos;s exactly what I&apos;ve done. Nevertheless this has been the closest I&apos;ve seen to a worthy desktop replacement so one that works for me must be coming very soon!